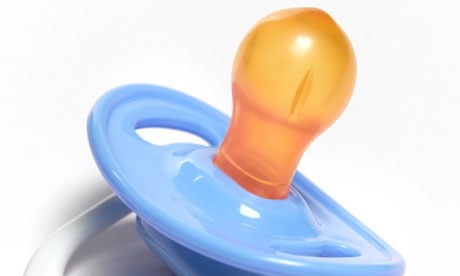 I never wanted to give my son a dummy and I certainly didn’t want to give him one at only five days old. It was a habit I was determined not to start. But, much like all other expectations I had before my son arrived, this concept was soon tossed out the window. Before you have a child lots of people tell you that all newborns do is sleep. What they don’t tell you is for the first few days and weeks the only place they’ll consistently sleep is in your arms! This was a pretty horrible shock, I don’t mind admitting. Five days in, recovering from my section and severely sleep deprived, Hubs and I were attempting once again to get Caterpillar to settle in his Moses basket/crib/bouncy chair or pretty much anywhere that would allow us both to have both hands free to eat our dinner. And he was having none of it. Quite right too really, he had no idea where he was and needed lots of comfort. But I needed a wee, and sleep and just a tiny moment of personal space. So we relented and gave him a dummy. That little miracle-worker then stayed in his mouth for the next two and a half years until last month when we bid it a fond farewell. I’d been putting it off for so long. We were dreading the long nights and constant upset we would face when we took it away. We’d tried to phase it out several times before but made the mistake of being fairly inconsistent and now we had no choice but to go cold turkey. I prepared Caterpillar a few days before by explaining about the dummy fairy, being sure to soften the blow by focusing on the part where she replaced his beloved dummies with a present. We decorated a shoe box for her and so far he seemed pretty excited about the prospect. Finally, the night came and I searched high and low for every dummy in the house (I still live in fear of Caterpillar finding a forgotten one under the sofa) and he happily tossed all his dummies in the box. All except for the one in his mouth. When he realised all actually meant all he did become quite upset and it was a little heart-breaking. After some coaxing he did and, after a little upset, he slept. I forced myself to cut off the teats and throw them deep in the bin as I knew that if he woke crying at 3am and I still had a dummy in the house I would likely cave. That first night was pretty rough, he woke a lot and was really restless. Oddly, he didn’t ask for his dummy once but was constantly asking for other forms of comfort so he was obviously thrown off by it. In the morning, he cried for it straight away but once we reminded him about the fairy and hastily shoved the box containing his present under his nose he was efficiently distracted. Over the next couple of days he would occasionally ask for his dummy but once reminded that he gave them to the fairy he seemed fairly satisfied and promptly forgot about it again. By the 4th day it was as if they had never existed! We are genuinely shocked with how well he’s coped. As with most things in life it seems, the reality of something I’d been dreading was nowhere near as bad as I imagined. One of the strangest things is my own reaction to losing the dummies. I’m not the sort of mum who particularly mourns the loss of baby stages but I found myself choked up throwing away those bits of plastic. The very last accessory of his babyishness. Similarly, I found that I was more anxious about him not having his dummy than he was! In hindsight, I’d realised how much I’d relied on the comfort it gave him. Stemming from my historic lack of confidence in my mothering abilities, I hid behind that comforter, knowing that it will always sooth him when I worry I can’t. With the dummy no longer an option it is solely down to me to step up and provide comfort and I find I like that very much. Would I give my next child a dummy? Absolutely. It brought relief to all of us when we needed it and getting rid of it hasn’t been the nightmare I anticipated. In short, I highly recommend the cold turkey method! Are any of you facing this challenge? How did you say goodbye to the dummy? I was like you, wasn’t going to give mine a dummy but caved so I could recover from the op and just to have some peace!! Our eldest (2 in a week!) loves her dummy (or nwni as we call it). I’m dreading the giving it up part… not sure when to do it really. I love the dummy fairy idea though – we will be using that one! Strangely, our littlest one (6months) won’t take a dummy at all. She loves to chew at EVERYTHING except a dummy! I always planned to give our babies dummies. I like them and think they are better than thumb sucking…now that is seriously hard to stop! Biggest boy had his until he was 4 (though only at night to sleep with since age 2) he gave it up no problems with a new bedtime friend in its place. You are a braver parent than I am! Our son is 2 and is welded to his dummy. It’s his go to comforter when faced with frustrations, injuries and tiredness. We have tried to wean him off gently but have failed miserably. I love the idea of the dummy box and its reassuring to know that the adjustment period isn’t as terrible as you imagined. The problem we have is our son is like a squirrel! We tell him he can’t have something and he will hide it away for later. Thanks for sharing your story and giving us hope! Forgot to add the #justanotherlinky tag! My eldest daughter took herself off from the dummy. Luckily it wasn’t as hard as I thought. She was 4 years old if I remember when she had the dummy last and it was her comfort. My youngest hasn’t touched a dummy since 2 days old! I definitely understand the feeling of sadness for that little piece of plastic. I feel that way every time I look at newborn clothes and look at how huge my baby is now lol (he’s 14 months). we’re not to the stage of getting rid of pacifiers completely, but he doesn’t use them regularly so hopefully it will be an easier transition. Aw well done you! I totally agree that it’s often harder for us to do away with these things than it is for the little people. 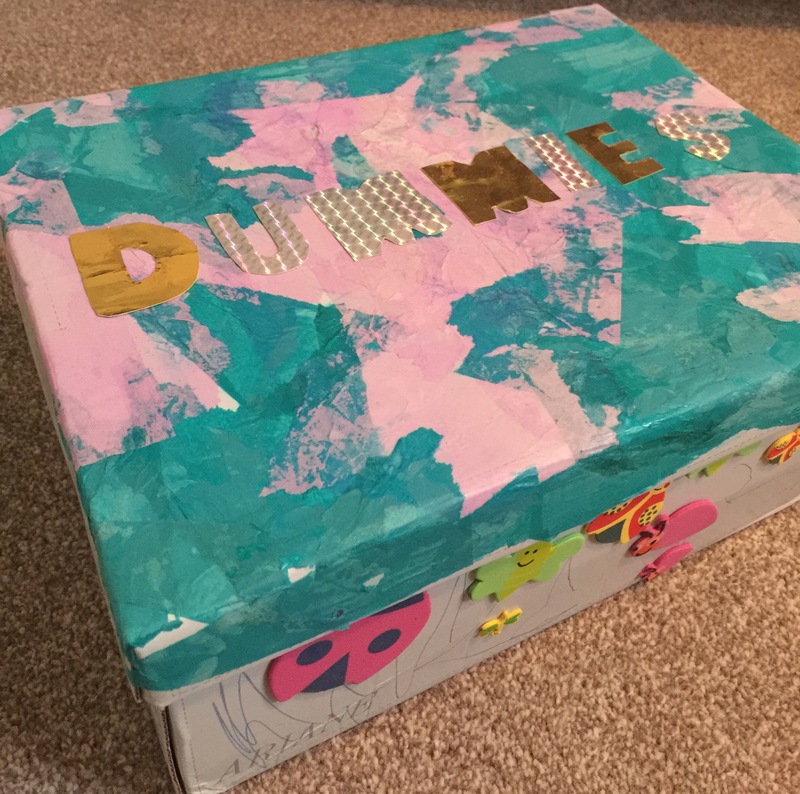 Love the shoe box / dummy fairy idea. Aargh! It always worries me when I see that a post is about dummies because I’ve been much worse than you (for all the same reasons) and I now have a three and a half year old who is still very much attached to his (and his muzzies). I am a terrible coward about taking them away but I know they will have to go this year because he starts school in September! He copes OK without them at pre-school and the childminders though so I know he is capable of it. Definitely food for thought! Thanks for linking up to #thetruthabout today and Happy New Year! We had exactly the same experience and like you were really concerned that it would be a real difficulty for us not to give it back to her. In fact I think I recall us caving and leaving it outside her door for her but she was stronger than us and didn’t take it. Sometimes they surprise you don’t they! Thanks for linking up with us for this first #sundaystars of 2016. Hope to see you next week. When we binned ours I was panicked about it and got really upset after too. I still have it actually as a keepsake. My tot barely batted an eye though. It’s funny how we worry ourselves unnecessarily, isn’t it? Well done. I want to get my little one off the dummy soon so thanks for the help. Good idea. Oh yes, I’m at that 2.5 years old stage and desperate to ditch it with my eldest. She seems to think it’s an extension of her though! I’m about to go back to work AND move house so think I’m going to stick with it for a few months. But by the end of the summer, it is going to be gone! So good to know it was painless. My 1 year old son (who had no interest in a dummy or thumb!) had to go through cold turkey no milk at night when I got delirious from lack of sleep at 9 months, and that was relatively painless. I’m hoping this will be too. Fingers crossed!